Sunflower seed oil is cold pressed from the seeds of the Helianthus annus, annual plant, (sunflower). The oil is pale yellow with very little scent. It is light in taste and consistency. It's a versatile, healthy, oil used around the world. I'll explain the variations of sunflower oil and its health benefits for the body, skin, hair and scalp! 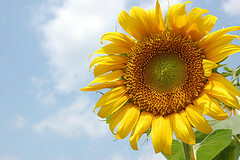 The sunflower is a sturdy plant growing five to twelve feet tall! Its head is consisted of numerous florets all crowded together. The outer ray florets bear colorful petals of yellow, red and orange. The disc florets are inside the circular head in a spiral pattern. The inner florets mature into seeds. Sunflower seeds can be a tasty snack! Sunflowers need full sun, moist and well-drained soil to grow the best. Mature sunflowers do not track the sun, they typically face east. Only young sunflowers track the sun, turning so their orientation changes from east to west within one day. Sunflowers are found around the world: Central America, Mexico, Peru, Spain and Europe. Sunflower oil is has vitamins A, B, D and E. It has more vitamin E than any other vegetable oil. The high amount of vitamin E lets it, naturally, resist rancidity. It's rich in minerals and lecithin, with high levels of omega 9 fatty acids, (essential nutrients for the body). High in polyunsaturated fat and low in saturated fat. Lower LDL, (bad cholesterol). It's heart healthy for the cardiovascular system! It's a less expensive, safe alternative, compared to olive oil. Sunflower oil is versatile. It's a nutritional ingredient to foods. Use it for cooking or frying. It's recognized by cooks, internationally. Sprinkle a little sunflower oil over salads, by itself, or find it in many salad dressings. It's included in Sun Chips, Kettle Chips, Ruffles, Lays and other snack foods. NU SUN: A mild oleic oil. Has less than 10% saturated fat than linoleic oil. Has 55 - 75% higher oleic levels. Has 15 - 35% linoleic oil. This oil is trans fat free. It lowers LDL cholesterol. HAs heart healthy benefits. LINOLEIC: High level of essential fatty acids and low levels of trans fat. Used in margarine, shortening, salad dressings. Used for cooking. OLEIC: Has mono saturated levels of 80% and above, (minimum of 80% oleic acid). Used in dried fruits, crackers, bakery goods, non-dairy creamers and for frying. HIGH OLEIC: Has high level of omega 9 essential fatty acids. Has vitamins A, B, D and E. Rich in minerals and lecithin. Sunflower oil is found in skin and hair care products: soaps, lotions, creams, cosmetics, shampoos and conditioners. It can be moisturizing, conditioning and cell regenerating. It penetrates skin quickly without an oily residue. Helps skin retain moisture and forms a barrier t0 resist infection. Useful for dry, damaged, sensitive or pre-mature aged skin. Sunflower seed oil can be used as the primary vegetable oil in a variety of skin formulations: soaps, lotions, creams, scrubs, bath oils. It's used in many formulas for massage therapy. RECIPE #! : Pour chosen mixture as shown above, depending on your skin type, into the palm of your hands. Rub hands together then apply oil to face, evenly. Avoid eyes, ears, nose or any sensitive areas. Massage mixture on face several minutes, with fingertips, rubbing in circular motions. Lay warm washcloth over face, (not hot!) The washcloth will open your skin's pores. Remove cooled washcloth and wipe away oil from face. Repeat this procedure until your face is thoroughly, rinsed. There should be no oily residue left on skin. Gently pat dry. This homemade face mask cleans skin, removing toxins and impurities. It will nourish, moisturize and protect skin. RECIPE #2: (By Dr. Oz) Mix together natural yogurt, sunflower oil and lemon juice. Apply to face, evenly. Wash off, gently. This homemade recipe will exfoliate, moisturize and prevent age spots. When making homemade soap use Sunflower oil in conjunction with more saturated oils. It will help your homemade soaps last longer. High oleic sunflower oil combines well with evening primes or hemp seed oils. Use it up to 10 - 20% in your homemade soap recipes, no more. It makes a soft bar of soap. It causes your soaps to slowly reach trace and harden. Reduce cost. Use it to replace a portion of olive oil in your soap recipes. Sunflower oil contains vitamin E, ( a natural preservative), however do not store it longer than 6 months. High oleic sunflower oil is, naturally, more stable and resistant to rancidity. Sunflower seed oil is slow to saponify. Try this "All Vegetable Bar" homemade soap recipe! Find your specialty or soap making oil, now! Sunflower seed oil is a natural hair moisturizer. It helps manage and smooth dry, brittle, hair. DRY HAIR RECIPE: Wet hair. Massage a thumb size sunflower oil on scalp. Comb oil through hair, to the ends. Wrap warm wet towel around hair up to 50 minutes OR wrap Saran wrap around hair, for no more than 15 minutes. Remove warm towel OR Saran wrap from hair. Shampoo and rinse hair, thoroughly. Towel dry hair or let hair dry, naturally. You can blow dry hair on air cool or low heat settings. CAUTION! Heat from blow dryers can damage hair and dry it out. It can cause splitting, weakening and breakage of hair. Keep blow dryers a good distance from hair. Do not blow dry hair long periods of time.